Doosan Portable Power is showcasing a whole lot of new products and updates at World of Concrete. Take a look at some of the highlights. 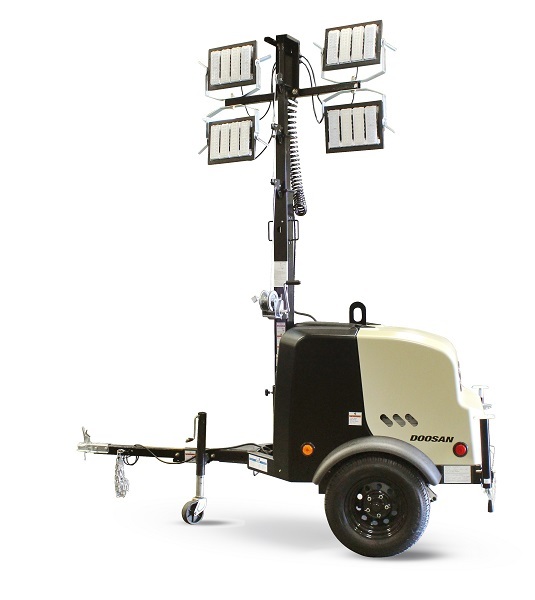 Both LCV light towers are standard-equipped with a vertical mast that manually extends to 23 ft. The vertical mast design significantly cuts setup time compared to the traditional laydown mast, and the upright mast position improves transport safety. With a new compact footprint, 17 units can fit on a standard flatbed trailer for more cost-effective transportation. The LCV6 and LCV8 are 82 in. long and 55 in. wide with a travel position height of 101 in. Doosan Portable Power now offers three newly designed models to its mobile generator lineup — G25, G50 and G70. Doosan Portable Power has introduced the P250/HP210 Tier 4 Final portable air compressor. The “two-in-one” model delivers the pressure and flow typically supplied by two units in a single air compressor. The P250/HP210 is the only air compressor on the market to offer 210 cfm high-pressure mode. The P250/HP210, which replaces the P250/HP185 in the Doosan air compressor lineup, offers dual compression modes. The P250/HP210 delivers 250 cfm of air at 100 psi in low-pressure mode and 210 cfm of air at 150 psi in high-pressure mode.